This short tutorial explains what Excel 3-D reference is and how you can use it to reference the same cell or a range of cells in all selected sheets. You will also learn how to make a 3-D formula to aggregate data in different worksheets, for example sum the same cell from multiple sheets with a single formula. One of Excel's greatest cell reference features is a 3D reference, or dimensional reference as it is also known. A 3D reference in Excel refers to the same cell or range of cells on multiple worksheets. It is a very convenient and fast way to calculate data across several worksheets with the same structure, and it may be a good alternative to the Excel Consolidate feature. This may sound a bit vague, but don't worry, the following examples will make things clearer. What is an Excel 3-D reference? What is a 3D reference in Excel? As noted above, an Excel 3D reference lets you refer to the same cell or a range of cells in several worksheets. In other words, it references not only a range of cells, but also a range of worksheet names. The key point is that all of the referenced sheets should have the same pattern and the same data type. Please consider the following example. Tip. If you intend to copy your 3-D formula to several cells and you don't want the cell references to change, you can lock them by adding the $ sign, i.e. by using absolute cells references like =SUM(Jan:Apr!$B$6). Based on the above examples, let's make a generic Excel's 3D reference and 3D formula. 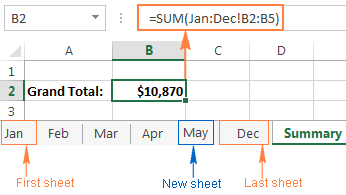 When using such 3-D formulas in Excel, all worksheets between First_sheet and Last_sheet are included in calculations. Note. Not all Excel functions support 3D references, here is the complete list of functions that do. Click the cell where you want to enter your 3D formula. Click the tab of the first worksheet that you want to include in a 3D reference. While holding the Shift key, click the tab of the last worksheet to be included in your 3D reference. Select the cell or range of cells that you want to calculate. Type the rest of the formula as usual. Press the Enter key to complete your Excel 3-D formula. 3D references in Excel are extendable. What it means is that you can create a 3-D reference at some point, then insert a new worksheet, and move it into the range that your 3-D formula refers to. The following example provides full details. Supposing it's only the beginning of the year and you have data for the first few months only. However, a new sheet is likely to be added each month and you'd want to have those new sheets included in your calculations as they are created. That's it! Because your SUM formula contains a 3-D reference, it will add up the supplied range of cells (B2:B5) in all the worksheets within the specified range of worksheet names (Jan:Dec!). Just remember that all of the sheets included in an Excel 3D reference should have the same data layout and the same data type. To make it even easier for you to use 3D formulas in Excel, you can create a defined name for your 3D reference. On the Formulas tab, go to the Defined Names group and click Define Name. In the New Name dialog, type some meaningful and easy-to remember name in the Name box, up to 255 characters in length. In this example, let it be something very simple, say my_reference. Hold down Shift, click the tab of the first sheet you want to reference, and then click the last sheet. Select the cell or range of cells to be referenced. You can also reference an entire column by clicking the column letter on the sheet. Click the OK button to save the newly created 3D reference name and close the dialog. Done! SUM - adds up numerical values. AVERAGE - calculates arithmetic mean of numbers. AVERAGEA - calculates arithmetic mean of values, including numbers, text and logicals. COUNT - Counts cells with numbers. COUNTA - Counts non-empty cells. MAX - Returns the largest value. MAXA - Returns the largest value, including text and logicals. MINA - Finds the smallest value, including text and logicals. STDEV, STDEVA, STDEVP, STDEVPA - Calculate a sample deviation of a specified set of values. VAR, VARA, VARP, VARPA - Returns a sample variance of a specified set of values. 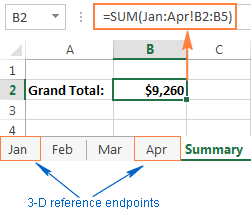 Because each 3D reference in Excel is defined by the starting and ending sheet, let's call them the 3-D reference endpoints, changing the endpoints changes the reference, and consequently changes your 3D formula. And now, let's see exactly what happens when you delete or move the 3-D reference endpoints, or insert, delete or move sheets within them. Insert, move or copy sheets within the endpoints. If you insert, copy or move worksheets between the 3D reference endpoints (Jan and Apr sheets in this example), the referenced range (cells B2 through B5) in all newly added sheets will be included in the calculations. Delete sheets, or move sheets outside of the endpoints. When you delete any of the worksheets between the endpoints, or move sheets outside of the endpoints, such sheets are excluded from your 3D formula. Move an endpoint. 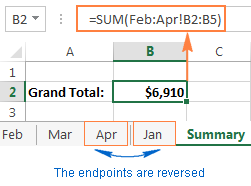 If you move either endpoint (Jan or Apr sheet, or both) to a new location within the same workbook, Excel will adjust your 3-D formula to include the new sheets that fall between the endpoints, and exclude those that have fallen out of the endpoints. Reverse the endpoints. Reversing the Excel 3D reference endpoints results in changing one of the endpoint sheets. For example, if you move the starting sheet (Jan) after the ending sheet (Apr), the Jan sheet will be removed from the 3-D reference, which will change to Feb:Apr!B2:B5. Moving the ending sheet (Apr) before the starting sheet (Jan) will have a similar effect. In this case, the Apr sheet will get excluded from the 3D reference that will change to Jan:Mar!B2:B5. Please note that restoring the initial order of the endpoints won't restore the original 3D reference. In the above example, even if we move the Jan sheet back to the first position, the 3D reference will remain Feb:Apr!B2:B5, and you will have to edit it manually to include Jan in your calculations. If the first sheet is deleted, the endpoint changes to the sheet that follows it. In this example, if the Jan sheet is deleted, the 3D reference changes to Feb:Apr!B2:B5. If the last sheet is deleted, the endpoint changes to the preceding sheet. In this example, if the Apr sheet is deleted, the 3D reference changes to Jan:Mar!B2:B5. This is how you create and use 3-D references in Excel. As you see, it's a very convenient and fast way to calculate the same ranges in more than one sheet. While updating long formulas referencing different sheets might be tedious, an Excel 3-D formula requires updating just a couple of references, or you can simply insert new sheets between the 3D reference endpoints without changing the formula. That's all for today. I thank you for reading and hope to see you on our blog next week! 16 Responses to "3-D reference in Excel: reference the same cell or range in multiple worksheets"
Excellent article. I've added it to our curated list of interesting and useful Excel articles. As you say, 3D formulas can be a great way to summarize data. However, errors in 3D formulas are common, as there are some traps to watch out for. For example, you discuss what happens when the user inserts, deletes, or reorders worksheets. One way to reduce such problems is to "bracket" the data worksheets with a blank protected worksheet 'DataStart' before the first data worksheet and a blank protected worksheet called 'DataEnd' after the last data worksheet. Then use a formula like =SUM(DataStart:DataEnd!B2:B5). The user can rearrange the data worksheets as they like within the 'DataStart' and 'DataEnd' worksheets without breaking the 3D formula. The bracket worksheets are blank (apart from a note saying to keep the data worksheets between them) and protected so that they don't affect the formula result. 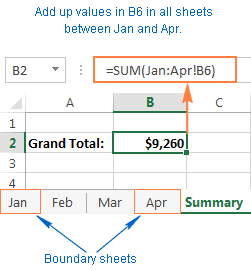 Excel 2013 added the SHEETS function, which can be useful with 3D formulas. For example, a formula such as =SHEETS(Jan:Apr!B2:B5) counts the number of worksheets in the reference - in this case returning 4. The count can be compared with the expected number of worksheets, to ensure that it is correct. Another potential problem occurs if data on one of the data worksheets is moved, for example by inserting a column. The data will no longer to included correctly as the 3D formula does not adapt to the new reference like a normal formula would. This type of error can be detected by using a non-3D checksum formula like =SUM(Jan!B2:B5,Feb!B2:B5,Mar!B2:B5,Apr!B2:B5) and comparing the result with the 3D formula to check that they are the same. Alternatively, or in addition, add a formula to count the number of numbers being referenced, such as =COUNT(Jan:Apr!B1:B5), to ensure that it is as expected. Thank you very much for your very informative and thoughtful feedback! Thank you for your help. I appreciate it very much. New to the blog and CERTAINLY LATE TO THE PARTY BUT ADDING "INDEX" HERE WOULD ALSO BE VERY USEFUL, CONSIDERING THAT WE KNOW DATA IS OF SAME SIZE/SAME CELLS/RANGE. SO TO MAKE DATA STATIC, "INDIRECT" WOULD REALLY HELP. 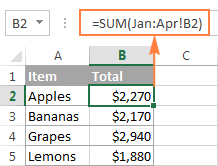 Is there any way to then use a vlookup in a another worksheet to read a cell, match up with the corresponding worksheet and then look up a value within that sheet? Here, I am looking for A1 in Sheet7, matching this with Sheet 6 (A1:A6) and giving me result from column 2. Hope it helps, or else send me your data for comment. I look to have a dynamic sheet name. 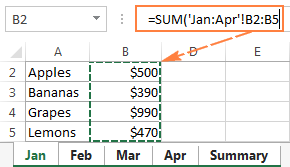 meaning the sheet name in a SUM formula is from a cell where the name is created. any ideas?? You can create a 3-D reference at some point, then insert a new worksheet, and move it into the range that your 3-D formula refers to. I was hoping this was the answer I'm looking for, but I don't think it is. Could you point me in the right direction? In a Google AdWords Report, I have a sheet for each campaign I'm running. Each sheet has the same headings, and I would like them to have the same formulas. Google's Cost/Converted_Click formula is awful, because it doesn't assign a Cost if there is no converted click, although money is actually spent. So I have a column for Cost and a column for Converted_Clicks. I would like to create named ranges for Cost and Converted_Clicks that refer to the same range on every sheet. Thus the formula =iferror(Cost/Converted_Clicks,Cost) would assign the cost even if the number of converted clicks is zero (div by zero error). 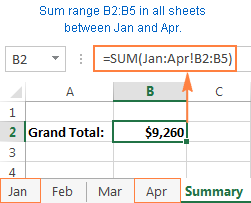 On each sheet, that formula would refer to the cost and the converted clicks on that sheet. For us to be able to assist you better, please send us a small sample table with your data in Excel and include the expected result. Thank you. what if I want to copy the value of the same range of cells (a2:h2 in the sheet tot gross) of different files in the same directory? For example I have in the folder "september" 120 files named invoice1.xlms , invoice2.xlms , invoice3xlms.......invoice 120xlms. I would like to create a new file who can copy the values I need that are in the same position in every file of the same folder. Please try Consolidate Worksheets Wizard to see if it can help with your task. Just choose the options Copy the selected worksheets to one workbook and Paste link to data. Is there a possibility to use these dimensional formulas in a graph? I mean, I want to define a graph series which consists of the same cell on multiple worksheets. I've used the D-3 many times with desktop Excel. Why is it not working with our online google excel sheets? It is showing an error being "Unresolved sheet name"